Mangaluru, Apr 30, 2018: MLA J R Lobo denied allegations of CPI(M) leader Sunil Kumar Bajal and BJP leader Premananda Shetty over ’Ashraya Scheme’ that is coming up at Shakthinagar on April 29th, Sunday. 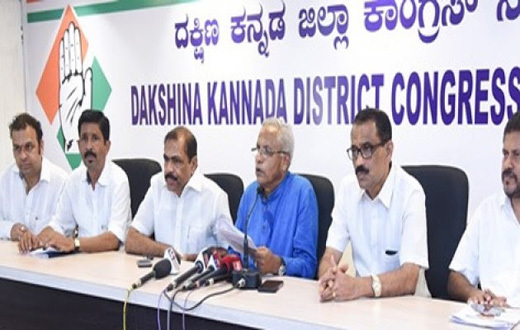 Sunil Kumar Bajal and Premananda Shetty had alleged the ‘Ashraya Scheme’ was ‘fake’ and also claimed that it was first planned by former BJP MLA Yogish Bhat. "On the other hand, CPI(M) leader Sunil Kumar Bajal has no information about the scheme. This scheme needs finance and involves a lot of procedures to get implemented. We can see that Mangaluru city commissioner has signed the title deeds and also that the deputy commissioner has approved land at Shaktinagar. This project comes under the government sector. There has been transparency in distributing title deeds," he said. “Rs 61.50 crore has been already sanctioned. We have allocated the ground floor to the disabled. Sunil Kumar Bajal has not contributed anything to this scheme. The allegations made by the opposition are false. I want to assure people that this project will be completed within 18 months. Once the election is over, I will take up the work. I urge people not to pay heed to rumours. I would also ask the opposition not to divert the minds of people. I have toiled hard for three years for this project and everything has been done in transparency. BJP has not done anything and communist never even dreamt of it,” he explained.